The Night Noodle Markets are returning to Perth, so you better get ready for a whole lot of delicious food. Some of your favourite hawkers will be back and they’ll be cooking alongside brand-new vendors, serving up mouth-watering meals from 5 to 14 April. With over 20 vendors to choose from, it’ll be hard to decide which amazing foods to try first. 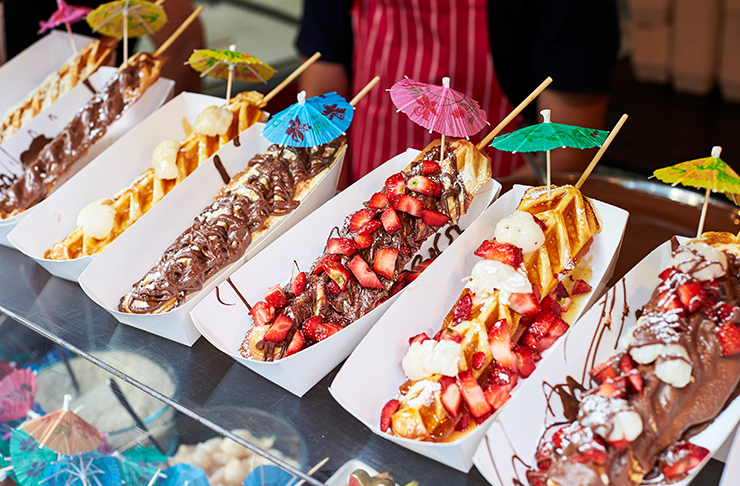 But don’t worry, we’ve got you covered with the best eats to track down at the Night Noodle Markets. You’ll definitely be wowed by the incredible dishes at Bao Wow. No matter what your tastes in baos are, they’ve got one for you. Meat lovers can get their fill of fried chicken, beef brisket and sticky piggy baos, while vegetarians can try their curried pumpkin baos. If you’re after even more baos, stop by the Bao Brothers Lil Diner, where they add a twist to traditional Korean cuisine. Try their ‘baogers’, like the truffle, mushroom and cheese baoger, or their BBQ pork spring rolls. There’s even tater tots and KFC, just not the way you would expect; the Bao Brothers make tasty okonomiyaki tater tots and Korean Fried Chicken. The kids from @Roll up have found a whole new look for roti, and it’s one you’re sure to find absolutely delicious. For an entree, try their roti dippers with a homemade peanut sauce, or for something more substantial, try their satay chicken, Peking duck or soft shell crab roti roll ups with mixed salad and mayo or peanut sauce. If you’re in the mood for pho, make your way to What The Pho. You guessed it, pho soup is their speciality. Their beef noodle soup is incredible and it’s sure to keep your stomach full... until dessert at least. Waffleland is truly the land of dreams, but you don’t have to wait to fall asleep to get your hands on one of their Cheeky Monkeys. Treat yourself to a waffle stick covered in ice cream, peanut butter sauce, bananas, pretzels, and so much more. The only thing better than waffles is waffles covered in sugar and ice cream, and after walking around all night at the market, you totally deserve it. POKLOL and Puffle have teamed up to bring you the best street food around, including their reinvention of the classic taco: the amazing Korean BBQ taco. You can choose to fill your taco with bulgogi beef, chilli chicken or Korean fried chicken, as well as kimchi, shallots and carrots. All with their special secret sauce, of course. The noodles don’t really fly at Flying Noodles, but they come pretty close. Come see these gravity-defying noodles for yourself and find out why they look, and taste, so incredible. With chicken, prawns, pork or vegetables on top, your tastebuds will really soar. Check out Twistto for the original Korean twist potato. These tornado potatoes are seriously good, and they are even better with Korean-style seasonings and toppings. With no messy plates, they’re the perfect market food, and they’re so good you’ll be going back for more. Little Kyoto really gives you a great taste of Japan. Try their fried noodles with pork or tomato, or their amazing Phoritto creation (it’s a pho filled burrito). If you’re feeling adventurous, you can try to tackle their Takoyaki Towers; they’re Japanese dumplings filled with octopus. These so-called ‘Gelato Gods’ have graciously bestowed upon us some amazing Filipino desserts. Try their Thrilla From Manilla; a banana bread and gelato filled pastry, topped with custard, or Brazo de Messina; a Graham cracker sandwich filled with layers of custard, gelato and meringue. For the first time ever, Gelato Messina is also bringing us the Filopieno; a gelato pie garnished with peach jellies, mango Chantilly and salsa, along with graham crackers. Forget dinner, we’re going straight for dessert. Want more markets to check out? You’ve come to the right place.